Sensory play refers to any type of play that stimulates the senses. This includes the five main senses of touch, smell, sight, taste, and sound, as well as the vestibular sense (sense of balance) and proprioceptive sense (sense of where each body part is in relation to the rest). In a previous post about sensory play, I wrote at length about how I came to understand the importance of sensory play. In that same post I also share some of the many benefits that accrue to kids who have lots of opportunities to engage in sensory play. As a parent, the sensory play experiences I have most focused on with my two kids are tactile sensory play, focused on the sense on touch, and vestibular sensory play, focused on movement. 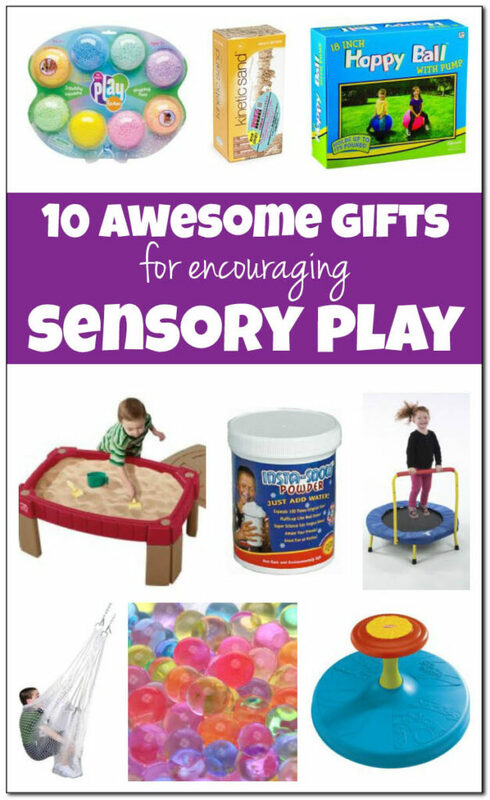 If you are searching for gift ideas to stimulate your children’s tactile and vestibular senses, check out this list of awesome gifts for encouraging sensory play. Note: For more great gift ideas for kids of all ages and interests, see my gift guides page. Below I have complied a list of 10 of the best tactile stimulating and vestibular stimulating sensory gifts for kids. But please heed this note of caution: Some of these sensory play materials would not be appropriate for children who put things in their mouths. As with any type of play, please provide appropriate supervision to ensure your children stay safe. Kinetic Sand: I love sensory play of all kind, but kinetic sand is one of my all time favorite sensory play materials. When I pull it out for my kids to use, I always set up an extra work tray for myself because it is just so darn fun to use! Kinetic sand is made from a mixture of sand and polymers, so it has a texture unlike anything I’ve ever played with before. Unlike regular sand, kinetic sand is soft and stretchy. It is also fairly mess free, because it sticks to itself but not to your hands. Its texture is less gritty than dry sand. It molds like wet sand without actually being wet. To see some of what you can do with this cool sensory material, read my post about kinetic sand. DuneCraft Space Sand: Space Sand is made from sand coated with a hydrophobic compound, which means that the grains of sand repel water but will stick to each other. It is this hydrophobic compound that allows Space Sand to be dumped into a glass of water yet emerge completely dry when scooped out with a spoon! If your child is into space, he or she may be interested to know that Space Sand is similar to the sand on Mars, and it is used in NASA Mars Exploration Classroom experiments. This bucket includes five different colors of sand for hours of fun sensory play. Educational Insights Playfoam Combo 8 Pack: The first time I introduced my kids to playfoam, they played with it for two whole hours. Indeed, they only stopped because I insisted they put it away so they could eat lunch! Playfoam is a non-toxic molding dough that never dries out. It sticks to itself but not to hands or the table, making it quite easy to clean. This pack includes 8 different colors that will be sure to inspire hours of imaginary play. My kids are particularly big fans of making “cupcakes” with their playfoam. Bag of Water Beads – Clear: Water beads are made from a non-toxic polymer that absorbs over 100 times their weight in water in order to form squisy round beads. They are purchased as teeny tiny beads that you can then hydrate by soaking them in water overnight. Water beads provide a wet and wonderful sensory experience for kids. Kids will get hours of enjoyment from the sensation of running their hands through a tub of water beads. We own clear water beads, which we often hydrate with liquid watercolor paints to create colored water beads for particular occasions (e.g. red, white, and blue for 4th of July). However, you can also purchase small bags of multicolored water beads as well. You can read about some of our adventures with water beads here, here, and here. Be Amazing Insta-Snow Jar: If you, like us, live in an area where it doesn’t snow, this product is the perfect way to bring a little “snow” into your children’s lives. Insta-Snow is a non-toxic powder that turns into fairly realistic looking “snow” when wet. The powder absorbs up to 100 times its weight in water, so this little container can make up to 2 gallons of snow. Step2 Naturally Playful Sand Table : Oh how I wish we had the space for a sand table! I love the idea of an elevated container for all of our sensory play materials to help my kids access them better. And although it is called a “sand” table, you could just as easily fill the table with water beads, corn kernels, dried rice, dried beans, shredded paper, or any other sensory filler of your choice! This table is a great size for toddlers and preschoolers. Therapy Net Swing : This swing was a lifesaver for us when QBoy was younger! When we noticed he would spend close to 60 minutes in the swing at the park each time we went, we decided to make things easier on ourselves by installing a net swing in a door frame of our home. For months I pushed him in the swing for upwards of 30 minutes each day in order to meet his need for vestibular input. Using this swing was so calming for him. He no longer uses it daily, but when the need arises we still hook it up from time to time to help him calm himself. The swing supports weight up to 275 pounds, so grownups can use it too! Toysmith 18-inch Hoppy Ball : This was one of my son’s favorite toys at his preschool. He loved to sit on it and bounce around the back yard. This toy is great for developing balance and coordination, as well as for getting active. Kids can use this toy indoors our outdoors, so this can be a great energy burner no matter what the weather! Like a trampoline, this toy provides vestibular input and can be calming for kids who crave vestibular sensory stimulation. Fold & Go Trampoline : Many kids love to jump and bounce. In fact, bouncing gives kids important vestibular input that helps to organize their brains. For many kids with sensory processing issues, jumping on a trampoline can be extremely calming. At the same time, many kids with vestibular issues can be clumsy and lack balance, so I love that this Fold & Go Trampoline includes a bar for kids to stabilize themselves if necessary. Playskool Play Favorites Sit ‘n Spin Toy : This was a favorite toy of QBoy’s when he was little. He loved the feeling of spinning himself until he was dizzy, at which point he would fall over in a heap of laughter. Kids ages 1-4 who love to move may enjoy this toy, as spinning provides intense and long lasting vestibular input.